This cycle has been developed by Ahaan Parekh, a 17 year old student of Physics at Sevenoaks UK. He is keenly interested in renewable energy and its application. His Eco Solar Bicycle was selected for All India Nehru Science Centre Innovation Festival and was awarded trophy for the same. The Eco-Solar Bicycle (ESB) consists of a solar panel, battery, charge control and motor. The speed is about 20 km/hr and the battery capacity is 3-4 hours. The bicycle is able to carry a load of approximately 40 kgs. 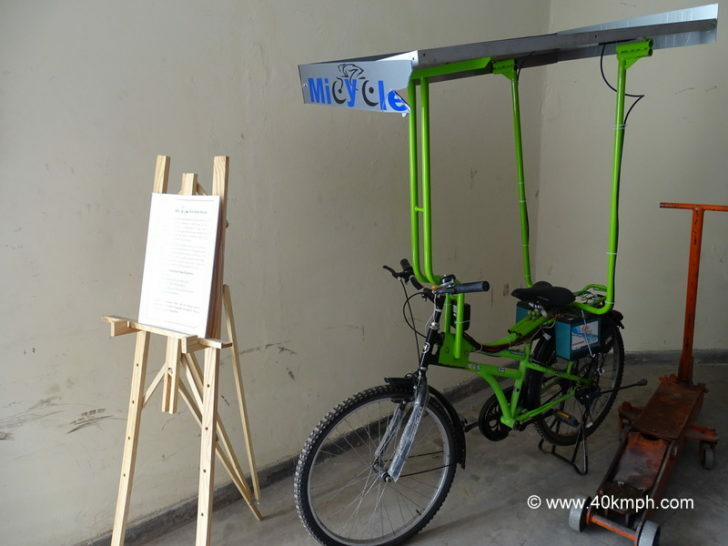 The charging time using the solar panel is about 5-6 hours but can work on manual peddling as well. Inspried by Mewal Solar Cell an integral part of Maharana of Mewar Charitable Foundation, The City Palace, Udaipur, Rajasthan.